When Fabric Talks – Listen! I always say that if the fabric isn’t talking it is not the day to buy or cut it. 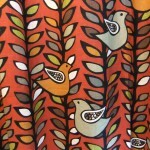 I had been eyeing this fabric at my local Joann Fabrics store for quite some time. I kept thinking it would make a great shower curtain for my guest bathroom. I dislike the shower curtains that you buy at your local Target, Kohl’s or wherever. They are cheap and very polyestery, if that’s a word. The fabric kept talking to me and I finally gave in. I bought it and that was only the beginning. I wanted to use the big snap on Dritz grommets instead of shower hooks. Well, when you do that you have to allow more width that makes it bigger than the standard 70″ shower curtain liner and you can’t hang the liner separate. So I took two fabric shower curtain liners and sewed them together to get enough width. Next up I had to sew the liner into the header of the shower curtain to attach it. Good thing I know how to sew and can figure things out. Anyway, it maybe the most expensive shower curtain I’ve ever had, but then again I have only decorated this bathroom once in the 25 years we have lived here. So if the fabric is talking….listen! You have the starting point for everything else in the room or project. 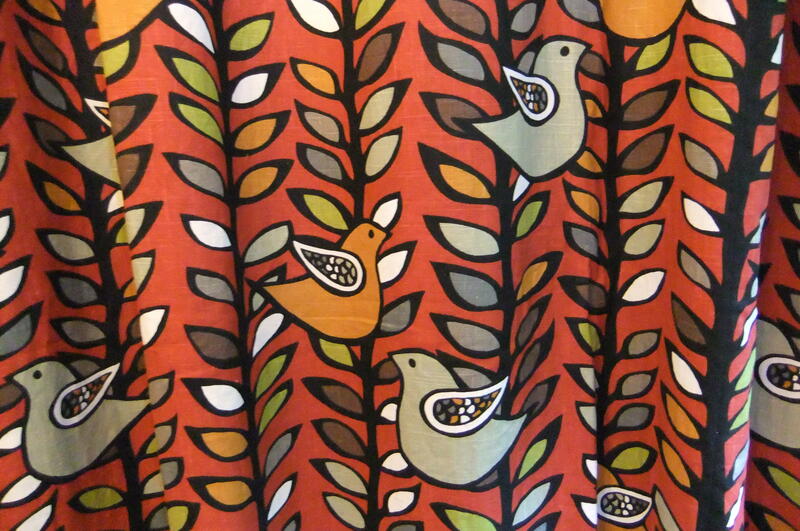 I even painted my walls Mango which matches the orange bird in the fabric. LOVE IT!!! I love the fabric and would love to see a picture of the completed bathroom. Very NOT bathroom, which is a look I love.